Invisalign aligners are a series of tight-fitting retainers that encourage the teeth to move. 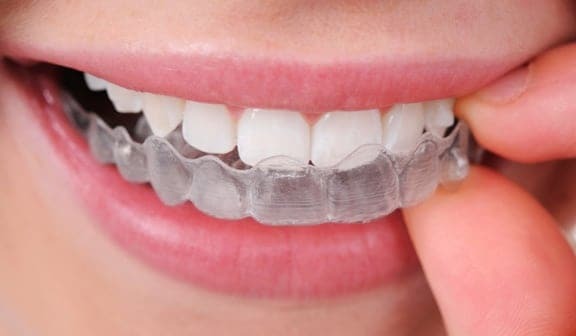 They are custom-made with a clear plastic or an acrylic material that slip over your teeth rather than metal braces which use brackets connected by wires. Today your Abington Invisalign Dentist can achieve the same results that you formerly could only achieve with a long period in unattractive metal braces. With regular braces, dental patients frequently experienced: pain, discomfort, mouth sores or injuries caused by the wires. Increased tooth decay from inadequate brushing and flossing, plaque buildup, tooth discoloration and tooth/bracket breakage while the braces are in place are also fairly common. In addition, with the metal braces approach, the patient is asked to restrict or completely abstain from some of their favorite foods including: popcorn, chips, bagels, hard-crusted bread, pizza crust, pretzel, nuts, certain candies, apples, carrots and corn on the cob. Your Abington Invisalign Dentist in Jenkintown can create a far better experience. Step 1: First your Abington Invisalign Dentist will take pictures and impressions of your teeth that are used to produce three-dimensional digital images. Your Invisalign Dentist then reviews the images and charts out a detailed treatment plan, including the desired corrective movement of your teeth. Your personalized Invisalign plan will even be able to show you a virtual representation of how your teeth will move and progress with each phase of your treatment. Step 2: Based on your specific treatment plan, a series of custom-produced, clear plastic aligners will be created that are customized for you. Simply wear them all day, and remove them when you eat, brush and floss your teeth. As you wear each series of aligners, you will see your teeth slowly begin to move into place. Step 3: About every two weeks, you will introduce a new series of aligners to wear as you progress to the next phase of your managed therapy. To observe your progress, you will also have regular checkups with your Abington Invisalign Dentist, normally every six weeks or so. The process typically continues for twelve to twenty-four months until the desired correction is achieved. Dr. Catherine West, Dr. Brian Wilk have more than 30 years of combined dental experience and can provide the required treatment and direction to deliver an effective Invisalign Dentist treatment plan. 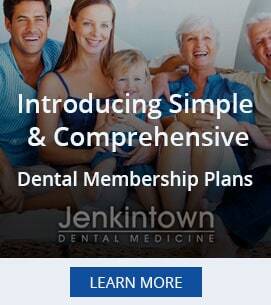 We have improved your neighbor’s smiles in Abington, Ambler, Cheltenham, Hatboro, Horsham Jenkintown, North Wales, Montgomeryville, Lansdale, Upper and Lower Gwynedd, and the surrounding areas in Bucks County including Warrington, Chalfont, New Britain, Doylestown, and Colmar. Call your Abington Invisalign Dentist at Jenkintown Dental today at 215-885-6565.